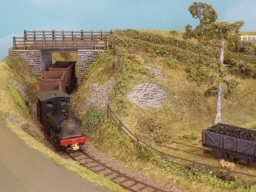 This originally appeared in Issue 92 (Autumn 2012) of Narrow Gauge & Industrial Railway Modelling Review. The text & photos are reproduced by permission of the editor Bob Barlow. I cannot recommend this magazine highly enough. 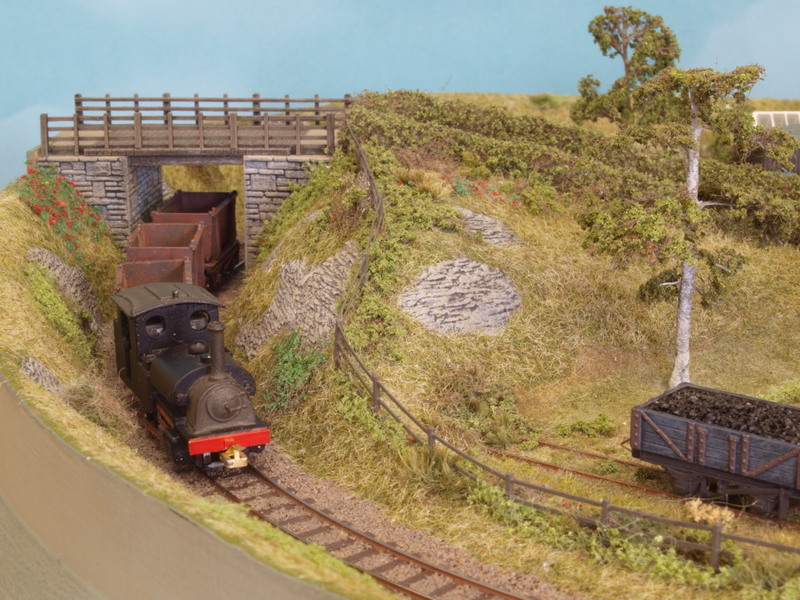 It deals with a wide range of narrow gauge modelling in all scales, with a strong emphasis on hands-on construction. 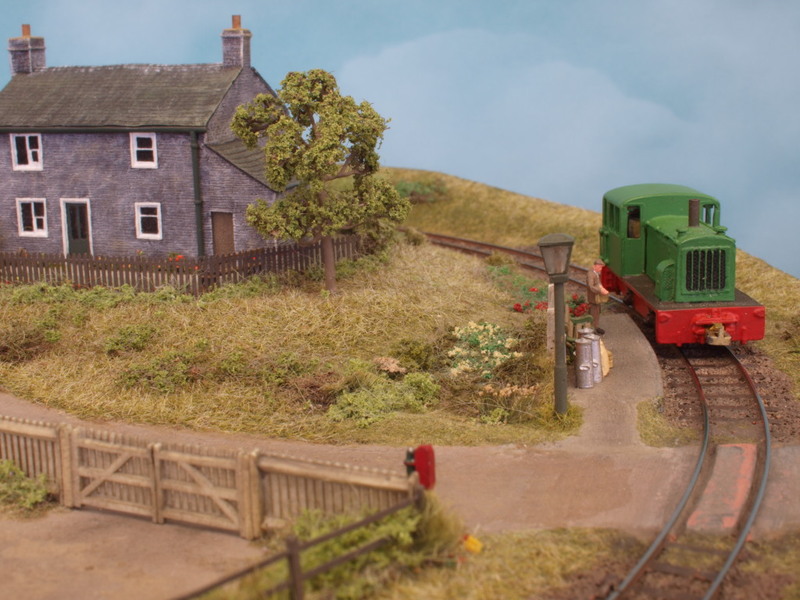 Mark Twain once said “Never put off until tomorrow what you can do the day after tomorrow.” So here I am in 2012, writing about a little layout, which was started in 1995 and reached a reasonable level of completion by 2000. Phil Copleston & I have been regular exhibitors at various narrow gauge modelling events, expousing the cause of the small scales, N & 2mm. Initially, this was largely a static affair, often using borrowed models. However, I felt this was an unsatisfactory state of affairs so for ExpoNG in 1995 I resolved to have something running. As usual, I left it a bit late, so the weekend before saw me looking in my local DIY emporium for a suitable baseboard. I found some machined MDF discs on sale, 400mm and 600mm diameter, intended for use as coffee tables. It occurred to me that I could lay a circle of 6.5mm gauge track around the periphery of the 400mm disc and make a nice little working display. Much nicer than a boring coffee table, anyway. A week of evenings saw a loop of 6.5mm gauge track together with a turnout & siding in place and operational. Technically, the gauge is actually ¼ inch as I used a slice of Tufnol as my track gauge. The track is made from 2mm Scale Association components, cut down PCB standard gauge sleepers and code 40 rail. I find soldered track construction proceeds quickly as there’s no waiting for glue to dry. The rail is actually code 40 bullhead laid upside down, as the resulting narrow railhead looks quite realistic, despite still being oversize in scale terms. Having built a glorified display track, I gave some thought to providing a rationale for it, however tenuous that might be. The 3ft gauge lines which interest me are the common carriers in Ireland and the Isle of Man because they provide a variety of stock and operation which I feel is lacking in purely industrial scenarios. No doubt somebody will contribute to the letter pages to disprove this, which I’d heartily welcome. 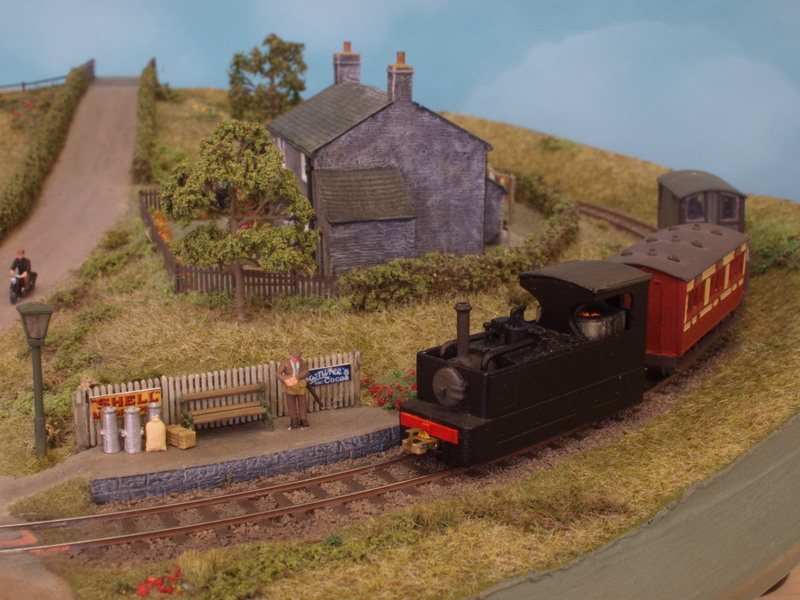 Two formative influences on my personal modelling are John Ahern & his Madder Valley Railway and P.D. Hancock with the Craig & Mertonford. Both have a relaxed attitude to mixing rolling stock but to a convincing overall effect. Hence, after the 1995 ExpoNG, some basic scenery with a vaguely Irish/IOM feel was put in place. 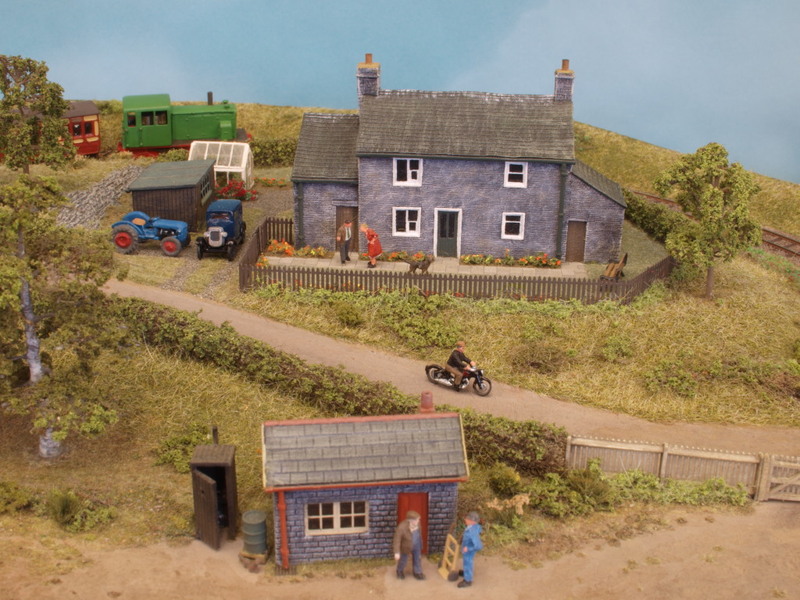 I had intended to make a feature of the Craggy Island parochial house with Fathers Ted, Jack, Dougal & Mrs. Doyle standing outside but the arrival of a review sample of a Shire Lane cast resin farmhouse from a certain MRJ editor (!) altered that plan. In retrospect, this was a positive move because it led to me modelling something much more prosaic & ordinary. Sounds dull but it isn’t really and the result is satisfyingly realistic. The siding became a small goods depot, protected by a gate: a feature that has always appealed to me. To break up the (already small!) layout into small (even smaller!) 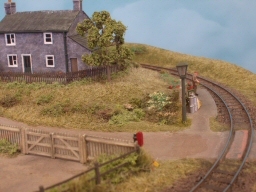 scenes, a road was put in to roughly bisect the layout, featuring a bridge on one side, providing a cutting and a level crossing on the other. The level crossing provided justification for a small adjacent halt. Basic texturing was done using various static grasses dispensed from a “Noch” puffer bottle. The variety of textures obtained was very pleasing and the layout showed that 2mmNG or British/Irish Nn3 was definitely a practicable option. Personally, I’m a little elastic on scale & gauge, provided everything is of a consistent size. There it languished until early in 2000, when my USA friends on the Nn3 email list suggested that I might like to bring it over to the NMRA convention in San Jose as part of an Nn3 display, where they would be assembling the very first Nn3 modular layout. This gave me a strong impetus to bring the scenery up to the level seen in the accompanying photographs, so as not to let the UK side down in front of our transatlantic cousins. The 400mm overall size proved useful as through a friend who has a business making flight cases for musicians, the layout was able to gain a robust purpose built case of the appropriate size for airline hand baggage. The San Jose trip was very enjoyable and it was great to put faces to names, which previously had been just email addresses. Later in 2000, I travelled to Expometrique via Eurostar, which was also a great experience and it was fascinating to see some of Nm work being done by AFAN (Association Francaise des Amis du N). A second trip to the USA was made in 2002 to the Narrow Gauge Convention in Rhode Island. As this was on the anniversary of the 9-11 World Trade Centre attack, the layout and stock were given very close attention by airport security on both sides of the Atlantic! 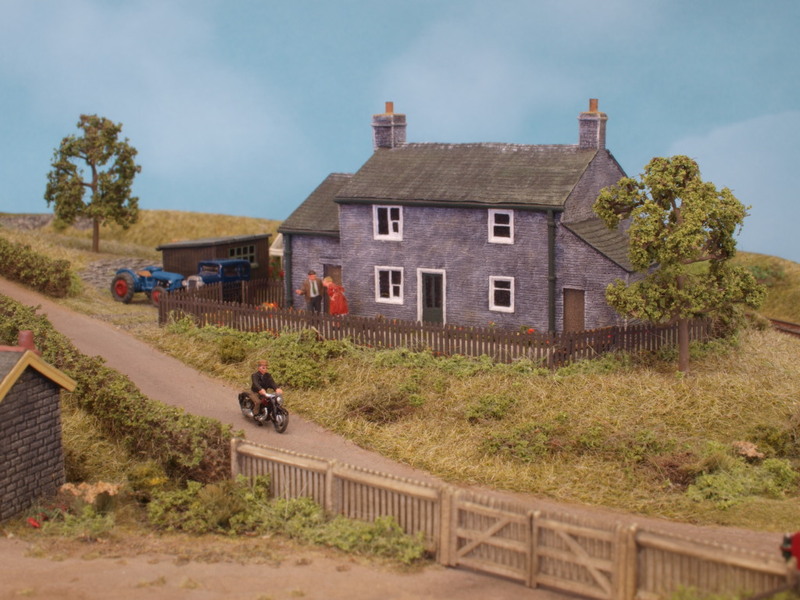 The layout also appeared on television, on “Blue Peter” alongside Copenhagen Fields, as part of the publicity for one of the joint Warners/MRC exhibitions. As such, it gained a Blue Peter badge and probably therefore qualifies for free entrance to some UK attractions! And, of course, it’s appeared at a significant number of UK narrow gauge shows. I get concerned that it might be somewhat overexposed but it always seems to be well received. As it lives in its purpose-built case between shows, the scenery keeps clean, fresh and dust-free. The track also stays clean, which helps reliability. What I’ve found with 2mmNG and Nn3 is that this scale allows you work in the tiniest space and still get a sense of place and room and airiness. To aid this, I have kept the colour palette on the lighter, paler side, which I believe is vital in smaller scales. Viewed from low down, the layout has the sense of having a horizon. This might sound like the whole thing was carefully planned. In reality, much of this is a happy accident. I’m not one for making in-depth plans, most of my modelling is conceived in my imagination with very little being drafted on paper. The layout has never really acquired a formal name. Had it gained the building I intended, it would have become The Craggy Island Light Railway. I don’t recall who first called it “The Pizza” but the nickname has stuck and I can’t really imagine being able to change it now, after 17 years. It’s also been suggested that I combine it with my other hobby of motorcycling, giving a novel form transport to exhibitions…if it’s not delivered within 30 minutes of ordering, the exhibition manager gets it free! Click on the image to bring up an enlargement, click on the back button to return to this page. A rare satellite photo of the pizza. The purpose built flight case for the layout. This has allowed the layout to be transported and stored safely, contributing immensely to its longevity. 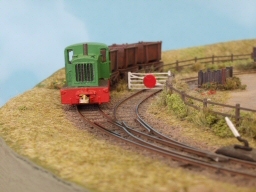 The diesel loco in this picture is a modified DR&GW Davenport kit from Republic Loco Works in the USA. It’s been modified to remove some of the more obviously American features. 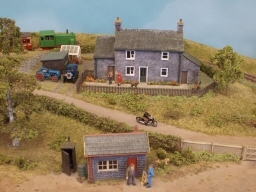 The farmhouse is from the now defunct Shire Lane Castings range. These were solid resin, cast from very delicately carved pearwood masters. These benefit from careful painting to bring out the subtle details. Most of the finishing was by the dry-brush method, with doors & windows picked out with a fine point brush afterwards. The tram engine is one of the two Peco whitemetal kits in this scale. 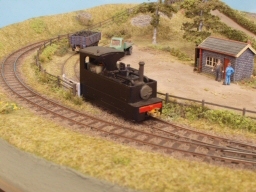 It’s based on a Glyn Valley prototype but enlarged to suit the Marklin 0-6-0 chassis. Masters for this were produced by Roy Link. Every item in this picture is a commercial product. 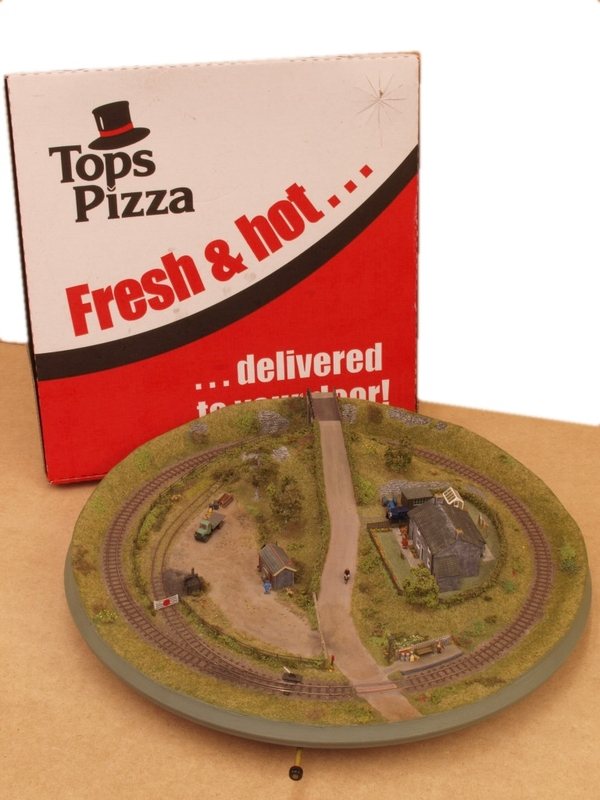 Some N/2mm scenic items can be a bit coarse but with careful assembly and painting, a nice result can be achieved. The motorcycle represents my father’s 1952 BSA 650. Where is KBY432 nowadays? The landscaping uses a range of items to create a variety of textures, mixing static grass with ground foam and teased out pan scourer foliage. 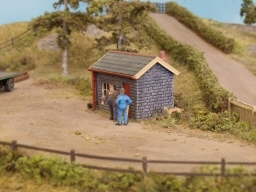 In 2mm scale it’s possible to adopt an impressionistic approach. Wild flowers, for example, are simply brightly coloured ground foam. The tram engine entering the goods siding. This is about as far as the loco can go as the rails are painted to represent little used track. Shunting can be achieved by using reach wagons. 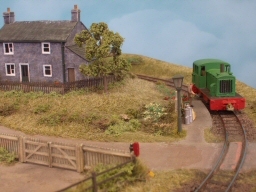 The other of the Peco whitemetal loco kits, again mastered by Roy Link. Quite characterful little models, as might be expected from Roy. I did replace the chimneys on both locos with brass turnings as the whitemetal versions are fragile in this scale. Assembly uses traditional slow-setting Araldite for strength. The Davenport is hauling some tippler wagons produced by mounting some Fleischmann DB containers individually on a shortened Peco wagon chassis. This makes a quite effective tippler wagon. A quiet moment by the yard office. Just two Prieser figures and a Ratio hut. I like the stances of Prieser figures, they are very natural. I buy the bulk packs and paint them as needed.